For me daffodils are always the first to herald Spring's arrival in my Pocono Mountain garden. A new addition is the Double Daffodil Mix I planted last fall to brighten the entryway to my front porch. A few yellow daffodils from years past also popped up too! Figured I'd give you a closer look at the double daffodils. Had lots of these. The yellow centers gradually faded to nearly white. The centers on these were a pretty shade of apricot that stayed true to color. And these were a vibrant yellow with darker centers. Another new variety I planted last fall was White Cheerfulness. Petite and pretty! Another new addition is Fritillaria. I think I will plant more of these. They are kind of cute! 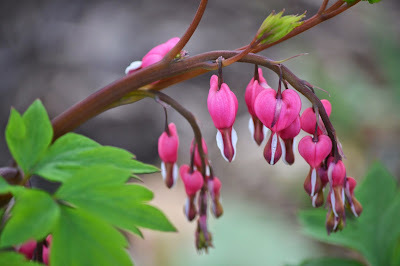 Of course, Bleeding Hearts are always a favorite in my mid-May garden. I have quite of few of these plants all around my yard. I just love them! I just love the tiny bell-shaped blooms on Pieris Japonica. The winter before last this plant was nearly destroyed by the piles of snow tossed onto it by passing snowplows. Lots of broken branches, hardly any leaves, and no flowers two years ago. So, this past winter I covered and secured it with a large heavy duty trash bag to protect it. This spring it bloomed and is now making lots of new leaves. My little Nellie Moser is alive and kicking! I bought her on clearance 2 years ago. Last spring she barely got two feet high after some critter decided she tasted delicious. This year she's fenced in and climbing! I really thought they were goners, but my four young peony bushes fought their way back this spring. They had been munched on late last summer. No leaves and just sticks were all that remained as fall turned into winter. They are tough plants! Growing plants in the Poconos is always an adventure. Hi Jane, this post makes me see your spring as a triumphant time - you get to see plants surviving the harsh winter. I love your different daffodil varieties.